The Start screen is one of the new features introduced with Windows 8 and the main attraction of the operating system. It lets you view all information in one place with the help of live tiles. It also lets users pin apps, files, folders, and webpages. As you might have observed, when you install an app from the Store or when you install a desktop program, Windows creates a tile of the app or program on the Start screen. While the feature comes in handy for users who would like to quickly launch the program or app, not all users want to pin all app shortcuts to the Start screen. Users who would like to disable this feature can now use a small free program called AutoPin Controller. 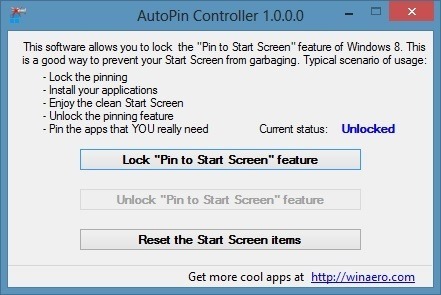 AutoPin Controller lets you lock the Pin to Start feature. When the Pin to Start feature is disabled or locked, you won’t see Pin to Start in context menu (right-click menu) and also Windows won’t create a tile of the app on the Start screen when you install a new app or desktop program. AutoPin Controller is compatible with both 32-bit and 64-bit versions of Windows 8. Visit the developer’s page to download the tool.